A unique and stylish landmark five-star hotel in the very heart of Edinburgh. The hotel has been beautifully refurbished to a high standard and individually designed. The 188 stylish suites and rooms have magnificent views of the city or the hotel's courtyard. For a culinary experience, visit the hotel's Michelin-starred hotel restaurant or try the chic and stylish brasserie. For relaxation visit the award-winning Spa, with its 15metre pool, ESPA treatment rooms and fully-equipped gym. The hotel offers ten conference and banqueting suites with natural daylight and views of Edinburgh Castle, Princes Street or the historic Old Town. 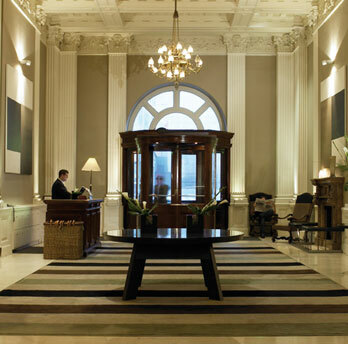 Classic Edinburgh railway hotel with lush rooms and a Michelin-starred restaurant. 10 conference and banqueting suites enjoying natural daylight and most offer views of Edinburgh Castle. Latest audio-visual technology including telephone, fax-modem, ISDN lines and wireless broadband internet access.Suitable for Intimate dinner parties, meetings, large receptions and conferences for up to 450. Please contact our concierge team for more info. Cancellation policy is 48 hours prior to arrival. Hotel requires for a further GBP 30.00 deposit per room to secure booking.rnAny bookings cancelled after 48 hours notice period will be subject to a cancellation charge - this can be to the value of your first nights stay. Adjacent to Waverley railway station which is served with services from all around the UK, including frequent direct services between London King’s Cross, Manchester and Birmingham.Adjacent to Waverley railway station which is served with services from all around the UK, including frequent direct services between London King’s Cross, Manchester and Birmingham. Located in Edinburgh's main shopping area and next to Waverley Station, The hotel is close to the leading luxury department stores and within walking distance of many Edinburgh attractions.